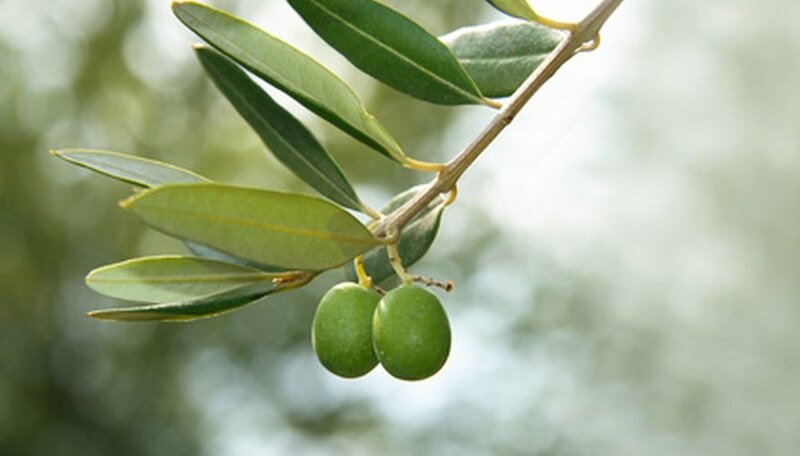 The olive tree (Olea europaea L) is a subtropical evergreen tree native to Turkey and Syria. Air temperature plays a vital role in growing olive trees as they will only fruit after exposure to cool nights and warm days during the winter, according to horticulturists with Texas A&M University. Olive trees are easy to propagate from cuttings taken in August or September. Remove an 8-inch cutting, the diameter of a pencil, from the olive tree. Cut the branch from the tree at an angle. Wrap the cutting in a moist paper towel and place it in a plastic bag until you are ready to plant it. Mix equal parts of vermiculite and sand in a container and add water. Stir the mixture as you moisten it to ensure that it is uniformly wet. Allow it to drain completely and then fill the planting pot with it, to within 1/2 inch of the rim. Pour fungicide over the soil in the pot, at the rate suggested on the label. Allow the pot to drain completely. Create a deep, narrow hole for the cutting by inserting a pencil into the soil. Dip the angled end of the cutting into the rooting hormone and tap it on the side of the jar to remove the excess hormone. Insert the cutting into the planting hole, burying at least half of it, and pack the planting medium around it. Place the pot in the plastic bag and secure the top with a twist tie. Place the bagged cutting in an area that remains 60 degrees F or warmer. The cutting should develop roots within two months. Fertilize the cutting when it has been in the pot for 12 weeks. Use a 10-10-10 fertilizer diluted to half the strength suggested on the package. Water after fertilizing, until the water drains from the bottom of the pot. Allow the olive tree to grow indoors until the following spring when it can be moved to the garden.